As the grizzly bear gains attention for the recent de-listing process opponents to the de-listing fear that the species won’t continue to expand in population and range. 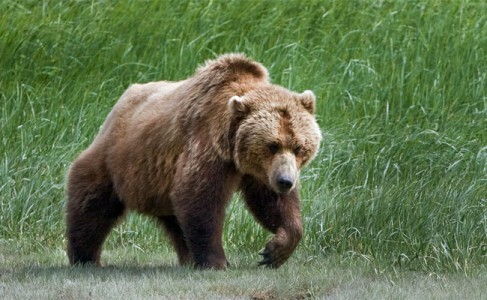 A recent news release by the Montana Fish, Wildlife and Parks’ biologists confirms that a grizzly bear sighting on a ranch in the northern Big Belt Mountains. The report foes on to say that the recent sighting is the second in the Big Belts this summer and is likely two separate bears. The first sighting was 3-year subadult male northwest of White Sulphur Springs, confirmed through photos taken by FWP trail cameras. The second sighting was confirmed from a video of the bear on private land in the area between the Missouri River and Hound Creek, south of Cascade. 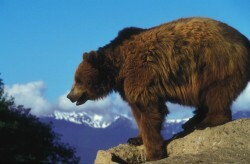 The bear also is a subadult male. No conflicts with the bear have been reported. This is the third grizzly bear sighting this year in areas the species has not been present for, perhaps, a century. In June, a pair of grizzlies apparently came down the Teton River from the Rocky Mountain Front and ended up near Stanford, east of Great Falls. The young bears were captured and euthanized after they preyed on livestock. In recent years, bears have traveled the river corridors – Sun, Marias, Dearborn and Teton – east from the Rocky Mountain Front looking for natural foods. But the animals can also be attracted to unprotected opportunistic foods, like grain, livestock feed, beehives, livestock, garbage and pet food. As grizzly bear numbers in the western half of Montana – from the Greater Yellowstone Ecosystem in the southwest, to Northern Continental Divide population – continue to increase, their range is expanding. It’s possible for grizzlies to be found anywhere in the western half of Montana, from the mountains, to river corridors, to even the prairie regions. People who are camping, hunting, mountain biking or recreating in these areas should always be prepared for a grizzly bear encounter, which means going out in groups, carrying bear spray and making noise. Similarly, home owners in bear country should take down bird feeders, secure garbage inside a closed garage or secure shed, feed pets inside, clean up chicken and livestock feed, and in general remove all odorous substances that could attract bears. Instead of putting out hummingbird feeders, for example, hang baskets of flowers.